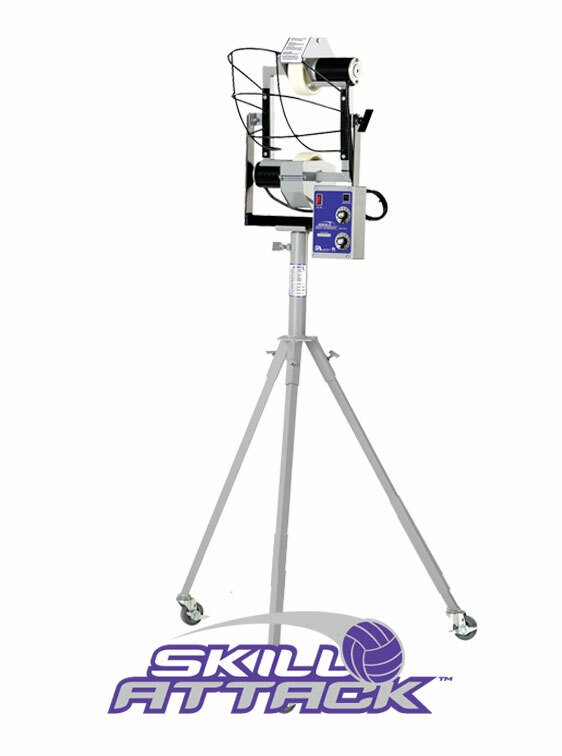 The Skill Attack is the perfect individual volleyball training tool with a ball release point of over 5′, not from floor level like other volleyball machines. It will deliver thousands of reps in daily practice of serve receiving, setting and digging with accuracy and repeatability. Designed for young serious players and individual practice at home as well as competitive club or school youth teams. Serving: The Skill Attack offers a full range of spins to deliver every type of drill including serves with either sharp downspins or breaking floaters at speeds up to 40 MPH. It is easily rolled along the serving baseline, changing the angle of serves. Spiking: The Skill Attack volleyball machine is great for digging drills on the same side of the net with power and accuracy. Setting: Providing rapid reps at varying intervals, the Skill Attack will provide accurate and consistent soft sets with no spin at any angle and height. Horizontal throwing head movement allows you to point ball delivery in any direction, working an player’s weak side to really extend any range. Vertical movement coupled with the horizontal movement, means you can instantly throw the ball to any point on the court, creating game situations & challenging players to perform in progressively more difficult circumstances. Portability: This small agile unit can easily and quickly be rolled anywhere on the court or in your backyard or garage. Storage: The Skill Attack will easily fit through any standard door for safe storage. This unit will also break down instantly for easy transportation; it will fit in the trunk of any car. The frame of the Skill Attack is powder-coated, rust-resistant steel tubing for extreme durability. The sturdy tri-pod provides stability and ease of movement using lockable, non-marking casters. Two variable speed motors directly drive two indestructible 5″ diameter ball-throwing wheels. Almost instant recovery provides rapid repetition, no waiting for air-powered launch system to recover.